JB & The Experience is an entertaining jazz group blending traditional standards with modern jazz to bring a new experience to all appreciative jazz listeners. The group is led by Jethro Banks, a strong, diverse, educated drummer, producer and musician who has grown up in the City of Beacon. He currently attends Beacon High School as Senior High Honor Roll student, set to graduate in June 2018. Jethro has been studying drums and music for 13 years, including reading, writing and composing. He began his formal study of music at age 6 with his drum teacher Joe Carozza at JC Drum School in Wappingers Falls, NY. He has performed thousands of hours in school concerts, local rock, R&B and jazz bands, talent shows, marching bands, church groups and choirs and orchestras. Due to his music teacher’s recommendations and training at school, he has participated annually since 2007 in the New York State School Musician Association Spring Festival being rated outstanding or excellent by adjudicators. Because of this, he was excepted into the All County and Dutchess County orchestras. He has been mentored by Jeff Haynes, Kahlil Kwame Bell and even met one-on-one with Roy Haynes, Ignacio Berroa and Bernard Purdy. He enrolled and completed classes for four years at the NYC Jazzmobile, which is a jazz course study that educates and teaches students in all performance aspect of jazz and music theory. In addition, Jethro has also performed with Jeff Haynes, Jacob Burns and Jon Batiste. 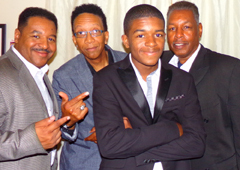 Along with Jethro, JB & The Experience is currently comprised of his father Arnrai Banks on piano, Kendall Buchanan on bass and Wilford Lammers on guitar. They all bring years of experienced jazz performance to this show.